Several shipping companies are already considering using drones in their business. With companies like Amazon breaking into the market, when people think of drones, especially for delivery, they generally think of flying robots. However, Starship Technologies, a company by the co-founders of Skype, is going for the grounded approach (but that doesn’t mean that they aren’t aiming high). The company hopes to advance driverless automation in smaller steps, beating autonomous car companies to getting driver-free wheels on the ground in England. Ultimately, Starship Technologies wants to put 6-wheeled, 50.8 cm (20 inch) tall rovers on the streets of London to bring sizable cargo for short deliveries. For customers who may have difficulties leaving the house, there may be a new solution – they would simply select items online, pick from a set of delivery windows, and then they could track the progress on an app and tap on their logged-in device to open the lid when their shipment arrives. This could be of great assistance to anyone who has mobility issues or has to stay home with young ones (and also those who are just a little on the lazy side). The robots would be equipped with an antennae that both helps with wireless connectivity and provides visibility beyond each drone’s natural height. 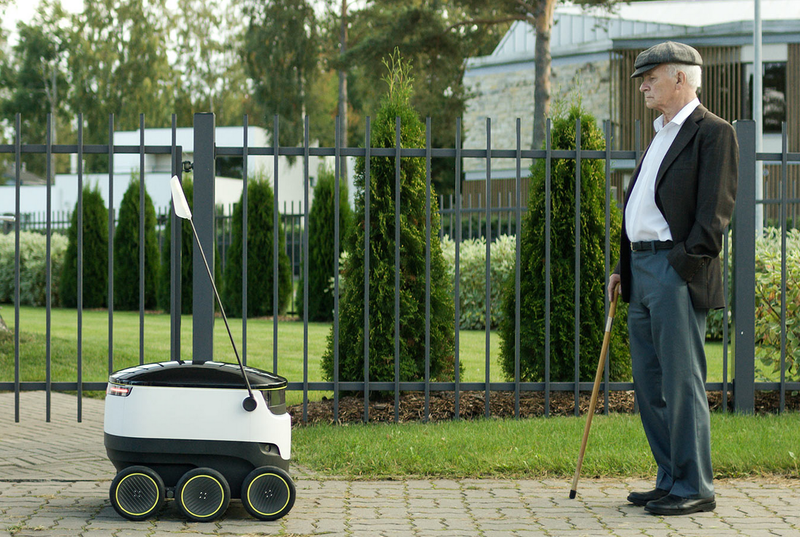 However, as the driverless robots, so far, move at only 4 mph (6.4 kph), it is still a wonder how they will even handle sidewalk foot traffic or crossing roads for that matter. The creators presume that the public will be watchful as to allow the rovers to proceed unharmed in their journeys. The robots will, however, be able to send signals to the police for emergencies. They would even be remotely operated by humans if necessary. So far, the robots have been tested indoors. The next step will be to take them to the streets.